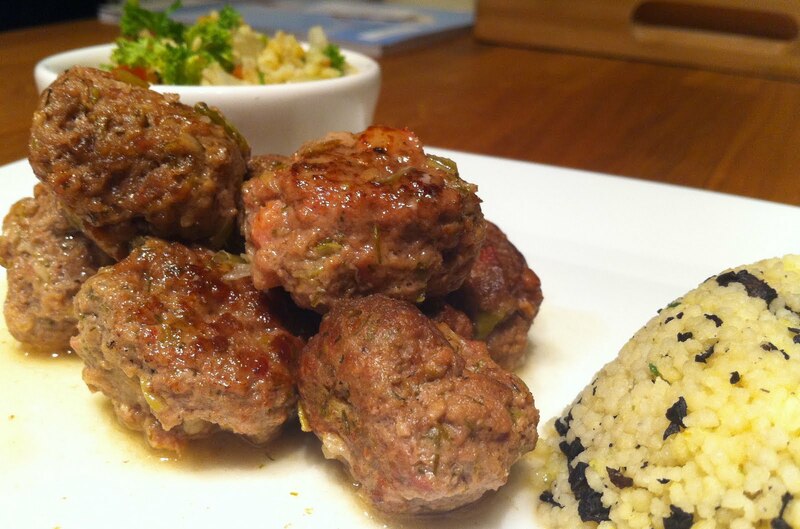 These delicious meatballs have a Lebanese flavour to them. They're so succulent and more-ish you'll need to make plenty! Top tip: Taste-testing by frying a small piece of your mixture and checking for seasoning is an essential step - you need to get the salt & pepper just right. 1. Trim and roughly chop the spring onions and place in a food processor. Add the pancetta cubes, lamb mince, chopped dill and cinnamon to the food processor and blend until thoroughly mixed. Add salt and pepper to season. 2. In a non-stick frying pan heat the oil on a medium heat, add a pinch of the mixture and fry until cooked through. Make sure you taste this to check the seasoning, and add more salt and pepper if required. Take off the heat while you form the meatballs. 3. Using a large teaspoon of mixture form into a small ball repeat until all the mixture is in balls. Re-heat the oil in the frying pan and add the meatballs and brown on all sides. Once browned lower the heat (or remove from the heat completely) and pour in the white wine. Bring to the boil and use a wooden spatula to ensure all the meat juices are loosened from the bottom of the pan. 4. Pour the contents of the pan into a oven proof casserole dish and cover. Place in a pre-heated oven at 200 degrees C for 1 hour. Serve with mushroom couscous or some home-made tabbouleh. 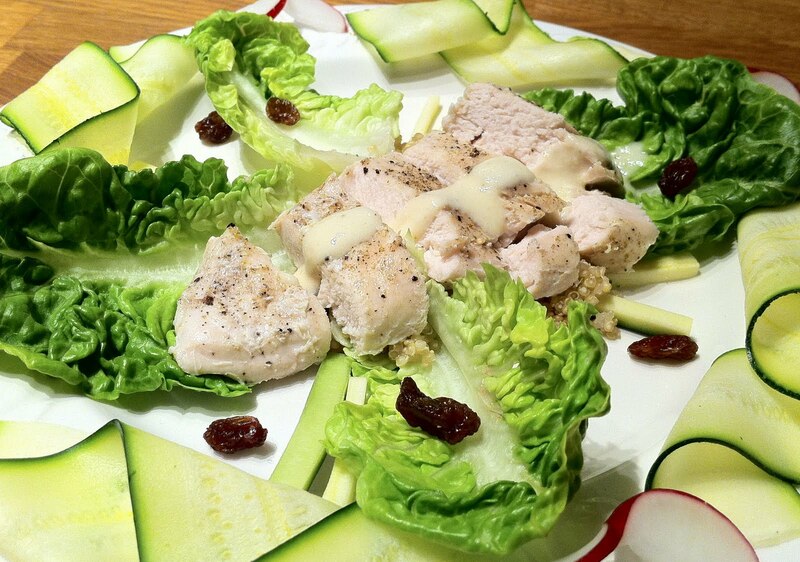 This is basically a deconstructed coronation chicken dish, with the emphasise on light, healthy and tasty. The chicken is steamed, not fried and the sauce is rich but light. All the flavours are there, but none of the calories! Top tip: You can create decorative vegetables by using a peeler - as you can see in the picture above! 1. Prepare the chicken prior to steaming. Each breast should be prepared in separate foil parcel, using enough foil to wrap the chicken. Thinly slice 1/2 an onion and scatter in the center of each foil square. Place one large tsp of coconut cream in each parcel. Place a chicken breast on top, score the top of the breast, and sprinkle over a pinch of curry powder. Add salt and pepper to taste, and a tiny knob of butter. Seal the foil parcels and place in a steamer for 20-25 minutes. 2. Next prepare the coronation sauce. Thinly dice the onion, and place in a pan with the wine and stock. Bring to the boil, and then grate in the ginger, and add the curry powder. Simmer for 2 minutes. Remove from the heat and add the ground almond and coconut cream. Using a hand blender, blend until smooth. 3. Prepare the green vegetables for the salad, using a vegetable peeler to slice the courgette and radish thinly to create ribbons. Discard the skins. Arrange the baby gem leaves and sultanas on the plate centrally, decorate with strips of courgette and radish, and serve the chicken and sauce hot or cold. These 'sushi' rolls are ideal for canapés or a simple starter. The three fillings are savoury and vegetarian, with herby bread used as the roll. Delicious! Top tip: Make the fillings in advance, and roll when needed! 1. Each of the fillings are to be prepared separately. First prepare the mushroom filling by placing the chestnut mushrooms in a food processor and blend on pulse setting until finely chopped into large breadcrumb size. 2. In a non-stick frying pan add the butter and oil and heat until the butter is fully melted and add the mushrooms, thyme branch, and the crushed and peeled garlic. Fry for 5 minutes and the lower the heat. Add the white wine and increase the heat a little and fry for another 5 minutes or until all the wine has been soaked up. 3. Now prepare the courgette and spring onion filling. Roughly chop the courgette and spring onions discarding the ends. Place in a food processor with the mint and dill (also roughly chopped) and blend for 3 minutes until finely chopped and well mixed. Transfer to a bowl and mix through the creme fraiche and lemon juice. 4. Now prepare the Italian filling by finely dicing the tomatoes and onion. Place in a bowl. Finely chop the basil leaves and add to the bowl and stir through, add a little pepper to season. 5. 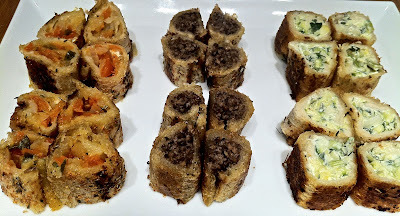 To prepare the sushi style rolls, firstly dust a clean surface with garlic salt and the dried herbs. On this surface place a slice of bread, remove the crusts. Using a rolling pin flatten the bread, this will also press the herbs into the outer side of the bread. Place the bread on a sushi mat seasoned side down, and add a strip of the mixture to one end of the slice (use approximately 1/2 of each mixture per slice of bread) and roll the matt over to create a tube of filled bread (if you do not own a sushi mat you can improvise by placing on a sheet of cling-film and rolling it over). 6. When all the rolls have been formed, heat the remaining olive oil in a non-stick frying pan and brown each sushi roll evenly on all sides. Remove from the pan, and cut horizontally into bite size pieces. I love Thai spicing, especially with marinated beef. This salad is healthy and hearty at the same time. You can make it as spicy as you like too! Top tip: You can use any steak cut thinly, I'd recommend a sirloin if you want it to melt in your mouth, but medallions if you are watching you're weight. 1. Prepare the beef by slicing thinly against the grain. Place in a dish and cover with soy sauce and crushed garlic. Cover and place in the fridge to marinade for a minimum 30 minutes. 2. Next prepare the salad. Slice the radish, discarding the ends. Peel the carrot skin off and discard, and then use the peeler to peel thin strips of carrot. Peel and thinly slice the red onion. De-seed the red chilli (unless you like things really hot!) then chop finely. 3. Now prepare the quinoa, by boiling according to packet instructions, and then drain. Toss together with the spinach, broccoli, and sliced vegetables. 4. Whilst cooking the noodles you can prepare the dressing. Finely chop the de-seeded red chilli and grate the ginger into a cup. Add the sauces and sugar and whisk thoroughly. Taste it to check your seasoning, you may wish to add more spice or more sugar. 5. In a wok, heat a little oil, and fry the beef strips on a high heat for 1-2 minutes each side. Drain the noodles and place on a plate, leaving a central well in which to layer your salad. 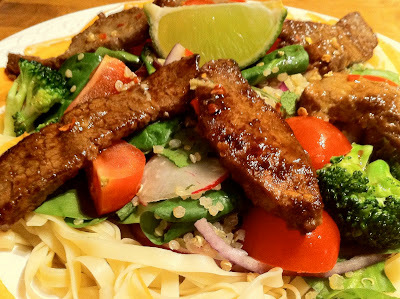 Decorate with strips of beef and dressing. Serve with a quartered lime and my Sesame Prawn Toast. Carrying on with this month's theme of soups and salads, here is another installment. The inspiration for this soup came from a recent ski trip I went on, where we were served something very similar. The toasted almonds add much needed texture to what would otherwise be 'just another soup'. Top tip: Toast the almonds in a dry pan, moving constantly to get a light brown colour, whilst ensuring they don't burn. 1. Peel and dice the onion. Peel and crush the garlic and add to the pan. Sauté with the butter until softened. 2. Add the frozen peas to the pan, and add enough stock to cover. 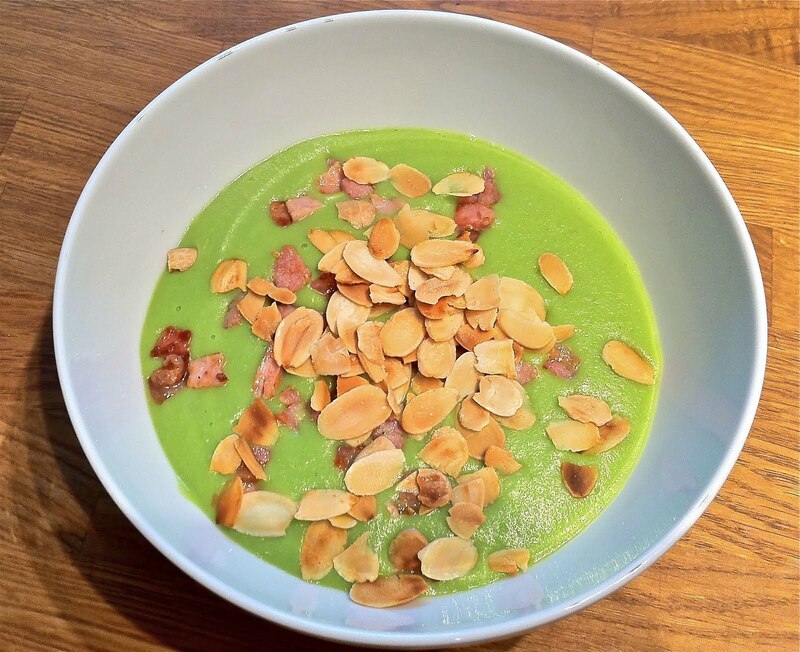 Bring to the boil and simmer until the peas are cooked through, then add the ground almond and season to taste. 3. Pour the mixture from the pan into a food processor and blend until smooth. 4. In a dry pan toast the sliced almonds, once brown remove from the pan and place to one side. In the same pan add the pancetta and fry until just crispy. Pour the soup into bowls, and serve with a generous sprinkling of almonds and pancetta.